but it has been prepared for it by a process of formation, by a slow building up of itself..."
A child can learn basic concepts of mathematics in either of two ways. He can learn by using concrete materials during the years when he enjoys manipulating equipment; or he can learn by abstract methods when he is in the elementary grades. Dr. Montessori demonstrated that if a child has access to mathematical equipment in his early years, he can easily and joyfully assimilate many facts and skills of arithmetic. On the other hand, these same facts and skills may require long hours of drudgery and drill if they are introduced to him later in abstract form. After she observed that the child who becomes interested in counting likes to touch or move the items as he enumerates them, Dr. Montessori designed concrete materials to represent all types of quantities. 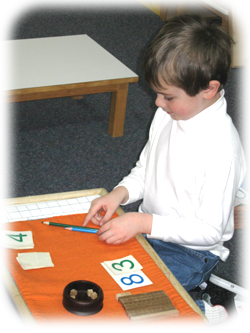 In a Montessori environment, a child not only sees the symbol for 1, 100, or ½, he can also hold each of the corresponding quantities in his hand. Later, by combining this equipment, separating it, sharing it, counting it, and comparing it, he can demonstrate to himself the basic operations of arithmetic. This activity gives him the satisfaction of learning by discovery rather than by being told. Eventually he develops an early enthusiasm for the world of numbers. In the Montessori classroom the child’s first introduction to numbers is made with a set of red and blue rods representing the quantities one through ten. The teacher helps the child to count the alternating red and blue sections of each rod as he arranges them in stair-like formation. The Spindle Boxes represent a parallel exercise in associating the numerals with the proper quantities. In this exercise both the symbols and the quantities are loose and both must be placed in order by the child doing the exercise. First he arranges the numerals in ascending order. When placing the appropriate number of red discs under each figure, the child puts the discs in rows of two. Each odd number has only one disc in the bottom row. This arrangement automatically illustrates the odd and even numbers. To learn the “teen” numbers, the child uses equipment known as Seguin Boards. The boards have the numeral 10 printed nine times in a row. The child forms the number eleven by sliding the figure 1 over the zero of the first 10. This shows her concretely that the number eleven is made up of 10 plus 1. Another set of Seguin Boards is available for learning the numerals 21 through 99. The famous Golden Bead Material designed by Dr. Montessori to illustrate the decimal system. There are bars to represent a Unit, a Ten, a Hundred and a Thousand. The children already know the terms square and cube from their work with the geometric material. The children are introduced to the decimal system with 3 basic experiences. First they build quantities with the bead material. The teacher starts with simple numbers. She says, e.g., “Bring me 3 Units.” Soon she can combine numbers in different columns: “Bring me 5 Tens and 7 Units.” Eventually the children enjoy accumulating large quantities on a tray, such as 8 Thousands, 4 Hundreds, 3 Tens and 7 Units. In the second exercise, the children find cards to represent the numbers the teacher gives them orally, such as 8 Tens and 3 Units. Finally they learn to combine the numerals on the cards with the correspondingly quantity of the bead materials. The children learn to translate the numbers, such as 7 Tens and 1 Unit, into 71. The Thousand Chain shows how the Thousand Cube would look if all its beads were laid in a single row. The chain, which is actually made of 100 Ten Bars, is used as an exercise in counting by tens up to 1000. Any exercise involving the exchange of the Golden Beads is usually called the Bank Game. The children use The Bank whenever they want to change Units to Tens, Tens to Hundreds, Hundreds to Thousands, or vice verse. Adding, subtracting, multiplying and dividing four place numbers can all be done with the Golden Beads. If two children wish to add, then they combine the two quantities on a larder tray. With this game, they also gain a real impression that subtraction is the breaking up of one large number into smaller ones. When learning division, the child is taught that division means sharing and that the answer is always what one person receives. Sometimes a child asks if the one remaining Unit can be divided. This is an ideal time to show him the Fraction Material, which illustrates how the Unit can be broken down. Whenever he is interested, the child learns how to write the names of the fractions and how to do simple combinations. A child in a Montessori class never sits down to memorize addition and subtraction facts; she never simply memorizes multiplication tables. Rather, she learns these facts by actually performing the operations with concrete materials. When the child wants to do arithmetic, she is given a sheet of paper containing simple problems. She works the problems with appropriate materials and records her results. Similar operations can be performed with a variety of materials. As she commits the addition facts and multiplication table to memory, she gains a real understanding of what each operation means. The Short Bead Stair represents the quantities one through ten in easily recognized colors. A single red bead represents 1. A bar of two green beads represents 2. A bar of three pink beads represents 3, and so forth, with the bar of ten golden beads representing 10. If a child wishes to do the sum, 3+5, she places the bar of three pink beads beside the bar of five blue beads, counts the total number of beads and records her result: 3+5=8. This same color scheme is used for the beads that make up the squares and the cubes of the numbers 1 through 10. The colored bead bars are also used for multiplication. Working with this equipment gives her areal understanding of what the term multiplication means. The Unit beads are used for simple subtraction. A square board with green skittles and beads is used for simple division. The skittles represent the divisor or the number of people who are sharing the quantity. To do the example 20÷4, the child puts four skittles at the top of the board. The he carefully takes twenty beads and shares them one by one. Each skittle gets five beads. He records: 20÷4=5, because in division the answer is always what the person receives. Parallel activities for addition and/or subtraction are always ready for the child who is eager to use different material. These include the Strip Boards, the Snake Game, the Dot Game and the Stamp Game. Various boards are also available for multiplication and factoring whenever the child is ready and interested. The child can do simple addition with this Strip Board which features red and blue rulers of graduated lengths representing the quantities 1 through 9. On the large square board, a child can place the numbers 1 through 100 in sequential order.